Implied volatility based products have not provided the hedge effectiveness many managers were looking for in 2011. In some instances, particularly as implied volatility came off sharply, index options simply did not perform as expected for many portfolios. 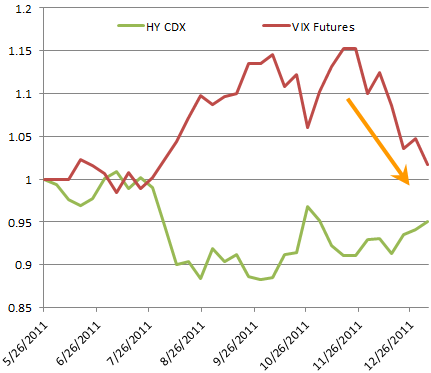 The chart below shows VIX futures versus the HY CDX total return index as an example of someone trying to hedge a credit portfolio with a VIX product. Having worked reasonably well through August-October, the hedge behaved poorly for the rest of the year. There are alternatives to using equity volatility products to hedge a portfolio. 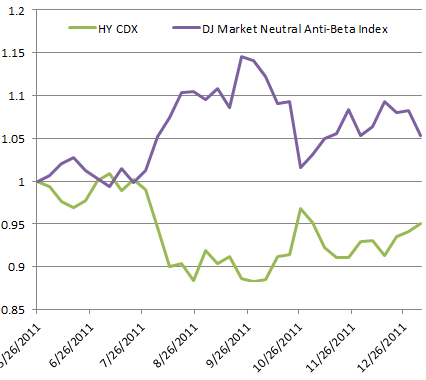 One of those is the Dow Jones Market Neutral Anti-Beta Index. It represents a market neutral basket of stocks which is long low beta stocks and short high beta stocks. The idea is that during market uncertainty and risk aversion, high beta stocks will under-perform low beta stocks. The chart below shows that when properly scaled, a hedge using this index would be fairly effective. There is in fact an ETF that seeks to replicate this index called QuantShares US Market Neutral Anti-Beta Fund (ticker symbol BTAL). It will work for a small investor but may be too illiquid for a larger institutional manager. But the underlying stocks in the index a fairly liquid and the basket can be easily replicated. It has to be adjusted on a monthly basis because betas for the constituent stocks change over time. The index methodology is included below.